For instant barista quality coffee in the comfort of your own home, look no further than on of our stylish Dolce Gusto coffee machines. These compact coffee machines take up very little counter space and with so many designs to pick from there's certain to be a coffee machine to fit your kitchen and lifestyle. The De'Longhi Eclipse and Krups Movenza epitomise the decor enahancing visual appeal of our Dolce Gusto collection, presenting sleek, modern looks that match aestethic apeal with functional design. The Movenza offers an ingenious space-saving design that allows you to close the machine to cover the spout and make the machine even more compact. An auto shut-off feature allows you to drink your coffee and go, without having to worry about whether you switched the machine off. Keeping your coffee machine clean couldn't be easier - they have removable water tanks, height adjustable drip trays and safety stop devices. Easy to clean and easy to use, all you need to do is fill the tank, select a pod and push the button and the machine will do the rest. Many Dolce Gusto coffee machines take over 40 types of coffee and hot drinks pods, meaning you certainly won't be limited in your drink choices. With just the push of a button you can have whichever drink you desire with minimal effort and no mess. All the coffee grounds are contained inside the pod, so all you need to do is throw away the pod and you're good to go. With 15 bars of pressure across the board, the Dolce Gusto coffee machine ensures an even distribution of water and pressure throughout the capsule and in turn delivers maximum flavour every time. For more variety you can also view our Tassimo coffee machines, some of which come with a caddy to store your favourite coffee pod flavours. 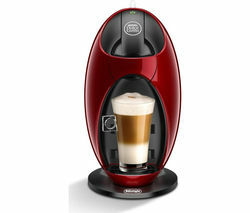 You can also view our range of Nespresso coffee machines.